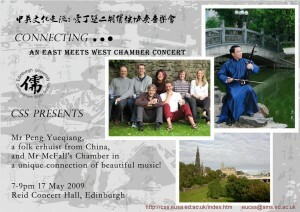 An East-Meets-West Chamber Concert Uniting the Traditional Chinese Folk Music of Erhuist Mr Yueqiang Peng and the “New Classical” Sounds of Edinburgh’s Mr McFall’s Chamber. 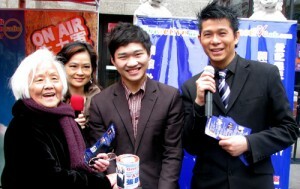 The Chinese community in the UK is urged to each donating one pound to fund the ambitious bid of Steven Cheung for the European Election this summer. International classical Chinese zheng performer DONG Yi and flutist & composer Eddie McGuire, the Chairman of Musicians’ Union (Scottish Region) are giving a joint-recital in the Queen’s Hall, Edinburgh on 7:30pm, Monday, 25th May 2009. After her historic symphonic recital with HU Bing-xu and China Philharmonic Orchestra in front of over 6,000 people in The Great Hall of the People in 2007, DONG Yi returns to Edinburgh, where she studied for five years, to share the stage with Eddie McGuire, one of the most prominent contemporary Scottish musicians. At the young age of 26, DONG Yi has been considered as one of the most influential performers of Chinese national musical instruments and one of the pioneers of the fusion of Chinese zheng and symphonic music. Eddie McGuire is the recipient of Scottish Arts Council’s 2004 Creative Award and the leader of the first ever Scottish band that visited China. The collaboration between these two musicians that can be traced back to the year of 2004 would be a tribute to any lover of Scottish and Chinese traditional and classical culture and any friend of Sino-Europe cultural communication.